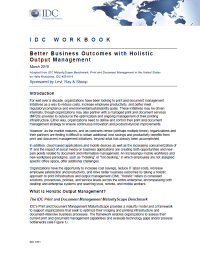 Download IDC's Print and Document Management MaturityScape for a framework to support your organization’s imaging and printing infrastructure and document-intensive business processes. Modern organizations must update their print and document management strategy to accommodate both desktop and enterprise systems and reach local, remote, and mobile workers. Increasing cost savings, reduction in IT labor costs and driving better business outcomes are some advantages of taking a holistic approach to print infrastructure and output management.